I've lived in St Andrews for the past few years, since I've been at university, and it's such a lovely town. It's pretty small but there are a tonne of fun things to do, good restaurants and bars and there are three (3!) beaches to enjoy! If you are a golfer, and maybe if you're not, you might know St Andrews is world famous as the home of golf. 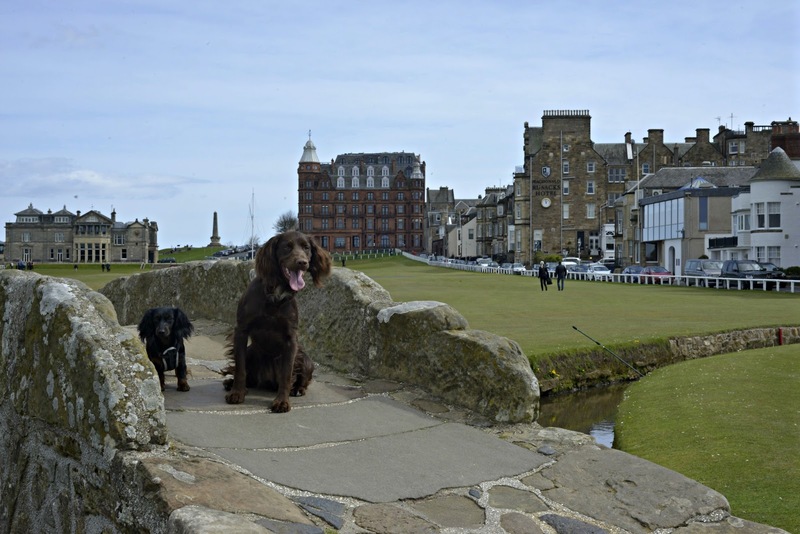 A bit more recently, St Andrews has also became well known as the place where Prince William met Kate! However over the summer, plenty of people visit the town to soak in the sights and even more to play a round of golf. Although there are a bunch of golf courses around the town, the most famous one is the Old Course which stretches through the centre of town. The most iconic part of the course is the Swilken Bridge! If you don't play gold but want to enjoy the course it is open every single Sunday for the public! This is a great opportunity to explore the grounds and see some special St Andrews sights. Plus you are allowed dogs- as you can see! As long as they are on leads you can all walk around the Old Course and soak up the Scottish sun (or rain). This is also the perfect time to get your own iconic bridge selfie- although I don't have one of myself we do have one of the dogs! Remember to follow the pups on Instagram and Facebook!